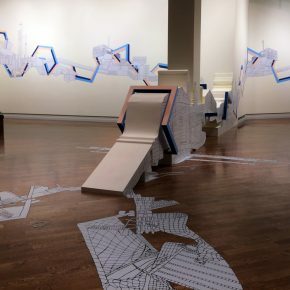 California artist Kim Schoenstadt has returned to Utah, where she received a warm welcome from the Brigham Young University Museum of Art (MOA): an entire gallery on the museum’s bottom floor has been devoted to one of the artist’s sprawling, architectural mash-ups. 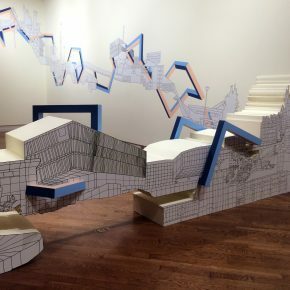 “Block Plan Series: Provo” spans two adjacent walls before extending three-dimensionally into the exhibition space, eventually returning to two dimensions when it ends (or begins) on the gallery floor. 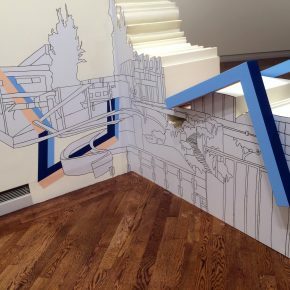 The work — part drawing, part painting, part installation — is a flowing amalgam of area landmarks, executed in a style akin to architectural drafting and welded together with Sol LeWitt-inspired sections of abstract geometry. Utah audiences will remember Schoenstadt from her 2012 exhibition at the Utah Museum of Contemporary Art, where the recipient of the inaugural Doctorow Prize for Painting filled the museum’s Street Gallery with her work. 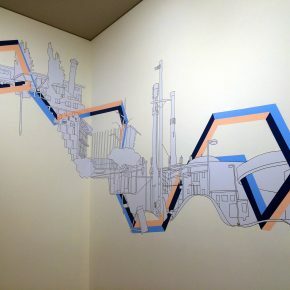 The exhibit included traditional works on canvas and paper, but was dominated by a series of large wall drawings, full of a sense of place and nostalgia, of which “Block Plan Series: Provo” is a continuation. 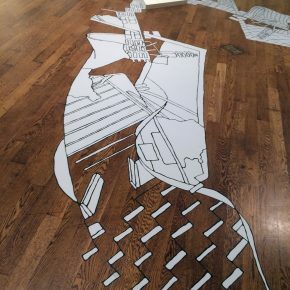 When Schoenstadt first approaches these locale-specific drawings/installations she investigates the place virtually, exploring what a search-engine perusal of place might reveal. She combines these impressions with what she discovers on site — in this case what locals (museum staff and others) thought to be significant landmarks. She blends all of these into a flowing, linear work that, in Cubist tradition, collapses space and, with the inclusion of vanished buildings, time. The work has a certain surety, a sense of continuity that doesn’t exist in disjointed reality. At first glance, it appears to be a computer-generated vinyl work affixed to the wall, but a closer inspection of the sometimes wobbly lines reveals the work is hand drawn. What virtually struck Schoenstadt about the locale was Provo’s “Silicon Slopes” reputation, its growing stature as a hub for computer technology and animation. 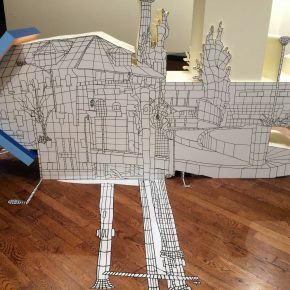 This is made evident in the right half of the drawing, which is a mirror image of the left half but has been rendered to look like a three-dimensional wire drawing, similar to those used by animators to create digital objects. As to the area’s physical landmarks, viewers may find more rhyme than reason to Schoenstadt’s interpretation of Provo: the town’s iconic (and since the remodeling of the Ogden temple, singular) temple is missing; and while Adobe’s Lehi building is certainly one of the more interesting architectural structures in Utah Valley (and can’t be missed on a trip south from the Salt Lake airport) it seems out of place in a drawing that otherwise is exclusively devoted to the town of Provo. Local haunts like The Malt Shoppe, and the old “turtle-shell” Reams store make sense, as do the BYU structures that predominate. Most of these are from the same modernist period, making easy visual transitions from one building to the next. Earlier structures, like the Maeser building, on campus, or the Provo tabernacle, and BYU Academy, off campus, are missing, so that one is left wondering if the buildings served the purposes of the drawing rather than the other way around. For the most part, though, the rhyme carries the work. Visually it is a pleasing piece, both as a whole — the work flows nicely and makes inventive use of the space — and in individual moments, whether they be the recognition of a single building or the warm effect of a wiggly line. The seemingly extraneous additions of graphic elements inspired by Sol LeWitt’s “Incomplete Open Cubes” serve to give the piece depth and provide some much needed color. And ultimately the reason of place will be the work’s most magnetic appeal. Sometimes it takes an outsider to present the familiar anew, and locals will undoubtedly enjoy moments of recognition as Schoenstadt’s simple lines and shapes trigger memories and associations (and for those unfamiliar with Provo, images and descriptions of the structures depicted have been provided by the museum).